Being a city planner in Ancient Egypt can be a daunting task; drought, civil unrest and earthquakes threaten to destroy all that you have worked for. 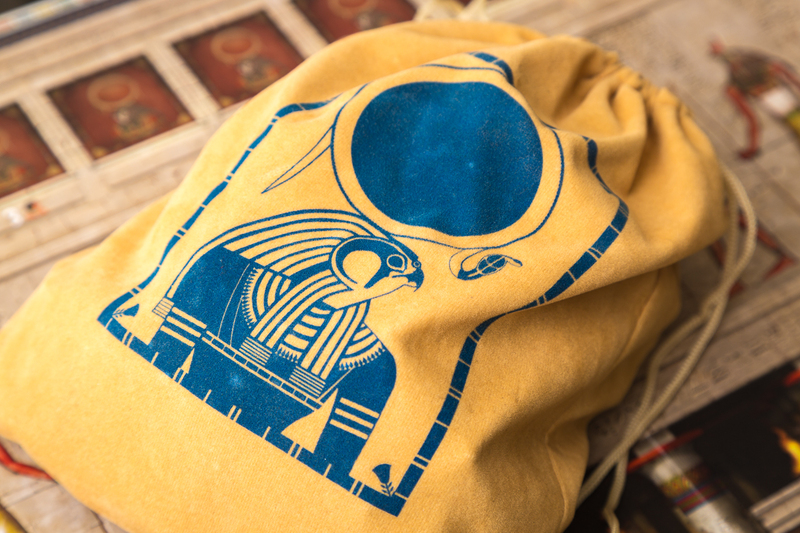 In a period that spans three epochs, or rounds, players will have the chance to build their little corner of Egypt and gain the favor of the Pharaohs. 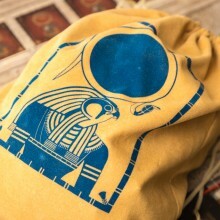 You must know when to invoke the will of Ra and his power of the sun and… auctions. Careful use of your sun disks will yield great architectural wonders, civil and agricultural advancements, and even a little fame and fortune along the way. 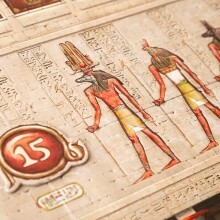 Ra is one of three in the “Knizia Auction” series of games. A recent reprint of this beloved 1999 title has many “oohing” and “ahhing” at the improved production values and new components compared to its predecessor. 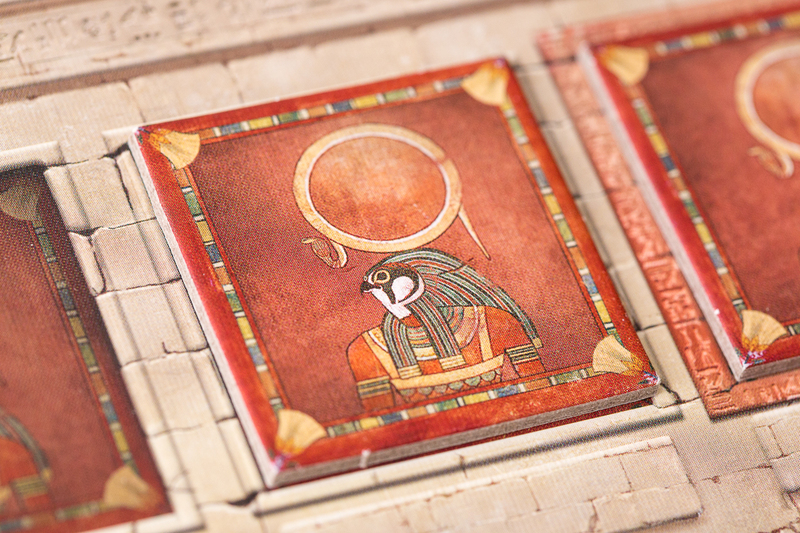 Such improvements include a new, textured central board, a nicely-sculpted Ra token, and artwork for the tiles. There are a whopping 180 tiles in the game which will have the very nice, but just-slightly-too-small drawstring bag bloated and close to overflowing at the start of the game. The artwork on the tiles themselves is very detailed and thematic, but can be hard to discern from across the board when they are placed up for bid. 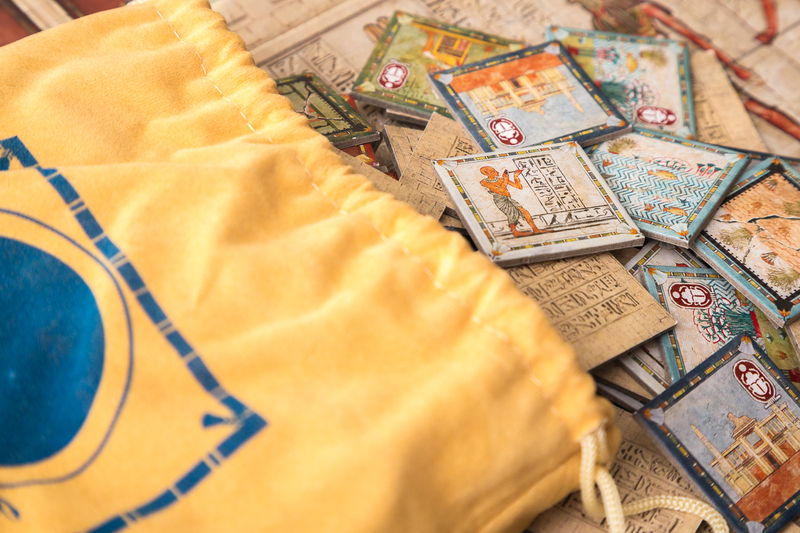 The box insert is bit of a head scratcher, as well – the useless divider, which has some very nice artwork depicting ancient Egypt, just takes up valuable real estate for all those tiles. 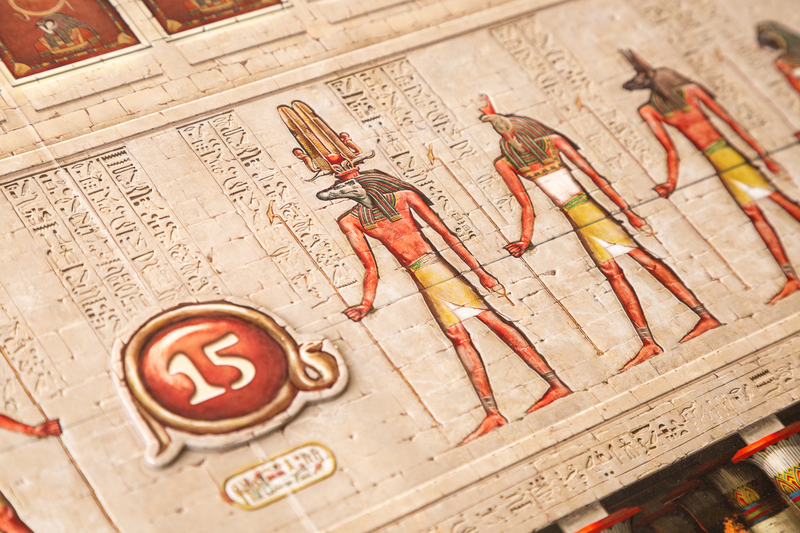 Ra will present players with a great number of set-collection decisions, some of which can yield points at the end of each epoch or only at the end of the game. To counter this anxiety of ‘what am I going to do?’, the turn structure itself is very simple; there are generally only two options on your turn, to either draw a tile or invoke Ra. 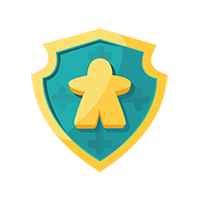 For those that have obtained a God tile in a previous auction, there is a third option – these tiles can be discarded in order to take any one tile from the auction track on the board. Still, for the majority of the game, players will be drawing tiles from the bag and placing them on the auction track on the central board. If the tiles currently available on the track look interesting to you, however, you have the option to skip drawing a tile and ‘Invoke Ra’ in order to declare an open auction. Bidding begins with the next player in turn order, with the individual starting the auction getting the final bid. If no one else chooses to bid, the invoker must give up one of their sun disks and claim the tiles. In addition to these optional auctions, one may be forced when a Ra tile is drawn from the bag. In this case, all players may pass without being forced to bid. In addition, these Ra tiles represents the timing of the epochs; when a certain number have been drawn from the bag, all available tiles on the board are discarded and the round immediately ends. After the third round, there is one more ‘end of epoch’ scoring as usual, and the game ends with the final tally of points. Now, bidding and set collection is the beating heart of Ra, so let’s delve into discussing that for a moment. We’ve mentioned running auctions quite a bit without saying exactly what you’re bidding with… in this case, it’s a trio of sun disks that each player receives at the start of the game. 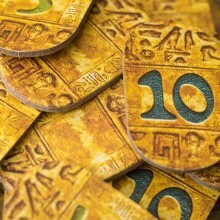 These disks are numbered from low to high to represent your bidding power, with certain values removed depending on the number of players in the game. As these tiles are open information, careful bidders need to take account of the other player’s resources as bids start going around the table! Now, keep in mind that there’s an additional twist as well – when bidding for tiles, you are also bidding on the sun disk that’s at the center of the board. At the conclusion of every auction, the winning bidder swaps the disk they used to win the bid with the one at stake. You may end up getting the tiles you really need, but you also may well be getting a low-value disk in turn, or offering up that high value disk of yours to your opponents in future auctions. The ebb and flow of these sun disks will often be key to your success in this game. As far as set-collection goes, there are two different types of sets to keep in mind, those that score on a per-epoch basis and those that will be tallied only at the very end of the game. Certain tiles will stay with you until the end of time, while others are as fleeting as the rains and will wash away at the end of an epoch. 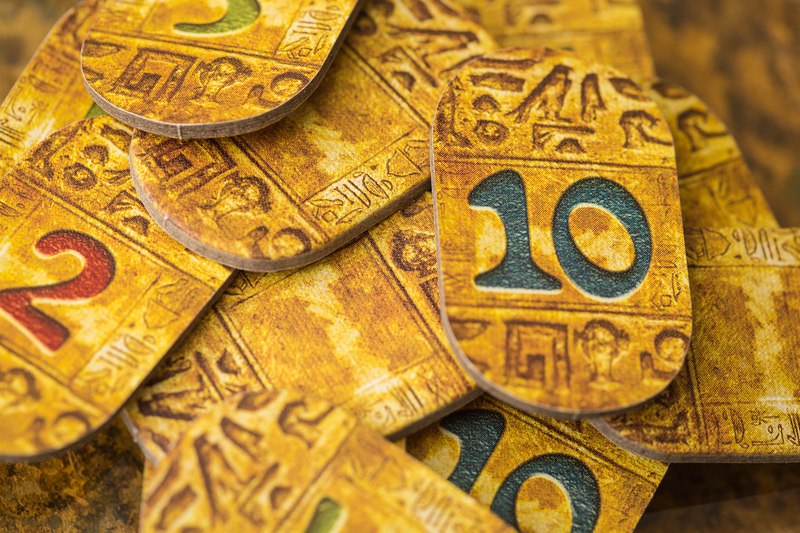 Tiles can have players competing for a majority, as with the Pharaohs, or sets of like and unlike types for monuments, while Nile tiles, no matter how many you have, require at least one flood tile per epoch to score. There are also a number of disaster tiles in the bag that, as you may have guessed, no one wants. If you win an auction with these tiles, you’ll be required to remove two tiles from your collection accordingly. Disasters like droughts will cause you to lose flood and/or Nile tiles, while earthquakes will cause your monuments to crumble. 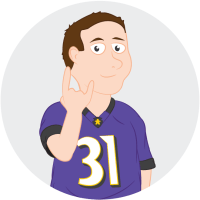 This may seem like a lot to remember, but luckily there is a great player card that helps you with all of the details that you need to deal with when deciding on making your bids. The experience I have had so far with Ra has been a mixed bag. In my opinion, playing with four or more is essential on this being a successful game. You can play with as few as two, but it feels very pointless as the rounds progress with not much tension to be had. The open information bidding is very interesting and causes some tough decisions when you are weighing the value of your sun disk against the tiles available for the taking. Sometimes, it may even be worthwhile to call an auction simply to get access to a valuable sun disk, despite the tiles on offer. Just be careful that you don’t find yourself holding out for that perfect showcase, only to see that you ran out of time as the final Ra tile is drawn to end the epoch. I prefer this type of open bidding mechanic over other auction games. I find it very tough at times to weigh my options when bidding with money or points in other games. I never know what is a good bid, and that just ends up not being a very fun experience for me. Having set numbers to work with allows me to focus more on my goals and make quicker bidding decisions at a glance. The Ra experience can at times end up being a frustrating one, though. It can be possible to end up with really low sun disk values due to bidding quickly in previous rounds and that makes it hard to win any auctions in future epochs. 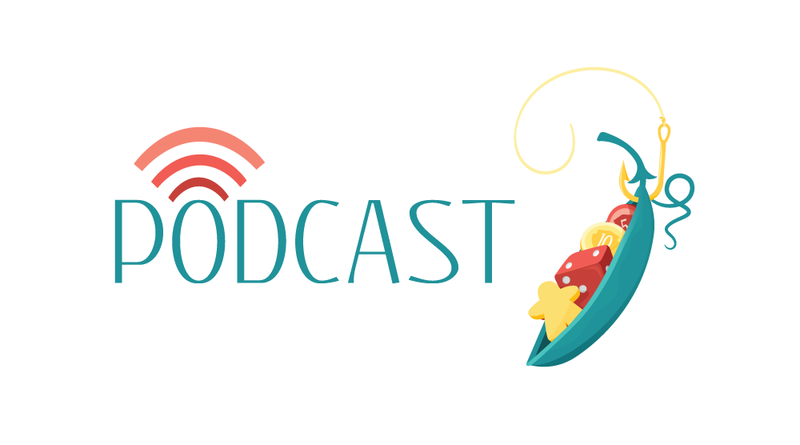 There is also some concern on falling way behind in the game early and having really no way to get a little kick to catch up, being at the mercy of Ra. This is where knowing how to make your moves and when to make them key to success. I find Ra to be decent and a mostly enjoyable experience, you just have no way of knowing the will of the gods when the box lid comes off and that first tile is drawn. While I often pride myself on finding enjoyment in most games, I am apparently just not at one with the sun god. No matter how hard I try, I find Ra to be unsuccessful. 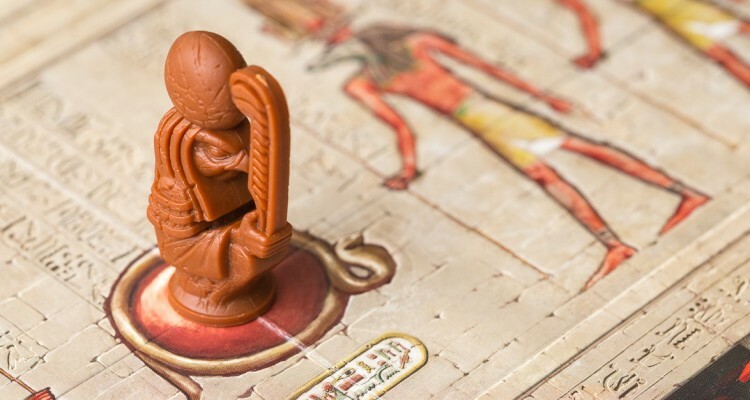 Now, it’s obvious that the Knizia name, and his auction trio in particular, is nothing for me to scoff at, but just because Ra is a classic of the genre doesn’t mean that it’s necessarily enjoyable. 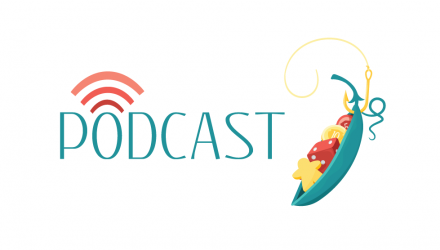 Ra looks to follow suit with many Knizia titles, offering difficult decisions and a lifetime replayability in a simple package, but it falls short for me. I enjoy its attempt at a more closed auction system and the wealth of scoring options, but I’ve found that the Gods of Randomness are cruel and Ra manages to channel this in a very focused way. The scoring opportunities are diluted by the total number of tiles and that, coupled with the frequency of auctions, makes it difficult to make meaningful progress. There are definite moments where the skill of deft auction calling and disk-spending shine through, but overall I find the game to be uninteresting. I give it points for its design, but find little to no fun in the gameplay.